VB-4 is a composite product that has been engineered to block and reflect high energy, low frequency road noise, an airborne sound, across a wide frequency range. 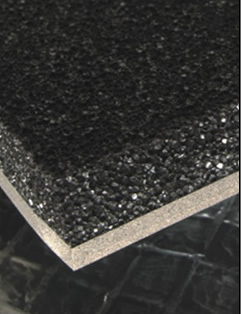 VB-4 consists of a closed cell neoprene foam layer that is bonded to a dense 1lb ft² vinyl barrier. The neoprene foam layer creates an "airsping" that floats or decouples the dense layer of vinyl. It is this airspring that allows for the reflection of high energy soundwaves and prevents the sound energy from passing through the dense layer. The foam layer does not absorb sound nor does it "filter" because it is far too thin to absorb high energy, low frequency sound waves. Be wary of any company that promotes a barrier material in this way. Conversely, VB-4 will prevent sound energy from escaping the vehicle which may be of particular interest to those of you who compete in car audio competitions. Where do I use VB-4? VB-4 is used primarily on flat areas of the floor pan and on the floor of the trunk or cargo area. VB-4 is installed onto the floor pan with the neoprene foam side down facing the floor pan. VB-4 weighs 1lb ft² and is equivalent to 6 layers of a vibration damping sheet. VB-4 has been installed on the flat areas of the floor pan and firewall. VB-4 installed onto the rear floor pan of a Full Size Dodge P/U.